Annie holds a BS from Azusa Pacific in Organizational Leadership with a minor in Marine Biology. An entrepreneur at heart, Annie started several successful business and organizations in her twenties and thirties. She has been teaching and designing sustainable programs since 1992. 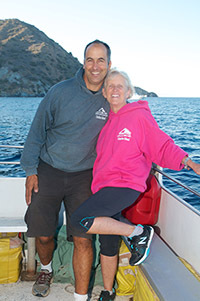 Annie started MSA on Catalina Island in 1997. She has pioneered sites in the San Bernardino Mountains, Newport Beach, San Pedro, Alaska as well as on board the newly acquired Floating Sea Camp: ‘Enhydra’.